يقع فندق Terrace Central B&B Hotel، المصمم ليناسب كل الضيوف سواء كانوا من رجال الأعمال أو السياح، في مكان ممتاز في أحد أكثر المناطق تفضيلاً في هذه المنطقة. يمكن من هنا للضيوف الاستمتاع بسهولة الوصول إلى كل ما تقدمه هذه المدينة النابضة بالحياة. سوف يعشق النزلاء موقع هذا الفندق، فهو قريب من أهم المعالم السياحية في المدينة . إن Terrace Central B&B Hotel حريص على توفير الراحة للنزلاء، فلا يوفر الموظفون جهداً في تقديم أفضل الخدمات وضمان حسن الاستقبال. إن واي فاي مجاني في جميع الغرف, خدمة سيارات الأجرة, خدمة التنظيف يوميًا, واي فاي في المناطق العامة, صف السيارات هي جزء فقط من الخدمات التي تميز Terrace Central B&B Hotel عن باقي الفنادق في المدينة. لقد جهزت هذه الإقامة الفندقية بعناية فائقة لتوفر مستوى عالي من الراحة. في بعض الغرف يجد النزيل تلفزيون بشاشة مسطحة, قهوة فورية مجانية, شاي مجاني, بياضات, مرآة. كما أن مجموعة الخدمات الواسعة الموجودة في الفندق لضمان راحتك تترك لك الكثير من الخيارات لقضاء وقتك أثناء فترة إقامتك. يحظى فندق Terrace Central B&B Hotel بموقع ممتاز وخدمات يصعب منافستها. وقت الوصول مطلوب في حالة الحجز. تتراوح مواعيد الإفطار الكونتيننتال في غرفة تناول الطعام بين 7:30 صباحًا إلى 9:30 صباحًا. هذا العقار ليس لديه مكتب استقبال على مدار الساعة. يجب تنسيق الدخول مسبقًا. يرجى إبلاغ Terrace Central B&B Hotel بشكل مسبق بوقت وصولك المتوقع. بإمكانك استخدام حقل الطلبات الخاصة أثناء عملية الحجز أو يمكنك التواصل مع مكان الإقامة مباشرةًً من خلال معلومات التواصل المذكورة في تأكيد الحجز. We enjoyed our time staying here although it was only one night. The owner was very helpful. Free car parking but unreserved area behind the hotel. Breakfast is continental but you could also find instant noodle, cereal and also; good coffee! Limited parking, but we when non peak so no problem. Very simple breakfast. Just walk few minutes is market and coffee street. Receptionist was very friendly, helpful and accommodating. The beds were very comfortable. We had rooms in the old part of the hotel and they are desperately in need of a professional update. I don't feel these rooms are suitable for anyone with breathing issues because of the dusty, cluttered, dilapidated fixtures and fitting or any physical limitations because of lack of amenities near the breakfast room and the lack of easy access from these rooms to the breakfast room. The location was within 10 minutes walk to the Fremantle markets, which was just down the street. Staff was friendly too, and the breakfast provided in the next morning was decent. Room and interior was a bit old and dated, but for a short stay, it is nothing to worry about. Great location at Fremantle area. However, the host was too particular about having a 3 year old kid along with me and my wife which we only decided to bring him along a few days before we came. I apologized for booking for 2 person and was made to pay for the extra person which I should. However, It was an unpleasant experience when he chose to broadcast this to everyone at the dining hall during breakfast. He could have spoke to me again in private if there was unhappiness over this issue. I am not sure of the intention but it surely was not a nice thing to do. JTS. No problem with any age kid....however you must pay for them and list them in your reservation. Our second stay at Terrace Central, stayed at the Bakery room this time. Room is private, spacious and can see it has lots of history. Enjoyed everything as usual, love the relocated dining area and definitely be looking at more stays here when we are back in Fremantle. Owner is a nice and helpful chap, room is okay size and beds were comfortable, car park is free (great) but limited and not easy to locate without owner's help. Property is quaint and cute, breakfast selection is adequate and fresh, location is good. Advisable to contact Barry to make arrangements if arriving at odd hours. Terrace Central Bed and Breakfast is run by the friendly and helpful Barry White. Barry is very nice and his kind nature fills Terrace Central B&B. I stayed in the Bakery which, as Barry says, "funky". The bed was really comfy and it had all the amenities I needed. Like any old building, the Bakery has quirks, but it was comfortable for three nights and a great price considering it had a bedroom, a bathroom, a lounge room and a little kitchenette with full fridge and microwave. I would definitely come back to Terrace Central B&B to stay again - I want to watch some of the video library and read the books Barry has available, plus pat the new dog!! Poor service, Reception staff was not helpful, good location, normal facilities and continental breakfast. we provide every service that we advertise...I cannot service your expectations, read the web site then you won't be dissapointed. Excellent location except for staff not so positive comment about we staying at budget room.. 10am check out time?? That's very unusual n too early for tourists.. Walking distance to the attraction spots! This is a lovely old property with great veranda for sitting out & watching the world go by! The rooms are a bit small but comfortable enough. Breakfast was basic but adequate. 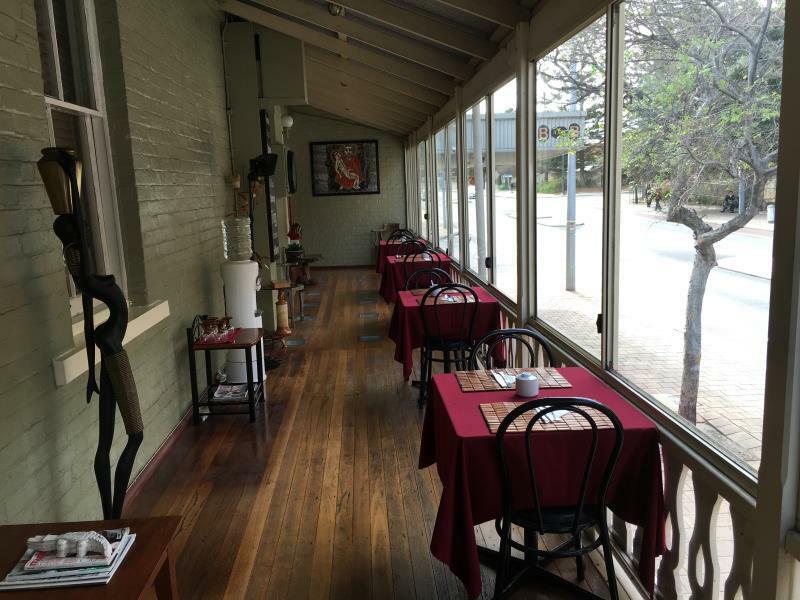 The location is excellent being 5 minutes walk from the Freo market and coffee strip. Definitely a good place to stay for a long weekend! We arrived after the reception was closed. The instructions for keys & parking was a little bit like a treasure hunt. We liked the room for its rustic look. Though we could hear the upstairs floor creaking, it was better then having traffic noises. Location is very near to food, shopping & Rottnest island ferries. Though its a little pricy as compared to other equivalent rooms, the savings in parking more then made up for it. Nice owner, comfy bed and spacious room! Located near to Fremantle market, staff had been helpful. Breakfast was simple but enough for me. the breakfast was cheap. Completely help yourself. Tinned fruit, cheap cereal and bread. No protein whatsoever. Value pack yoghurt and frozen muffins. After 2 days we couldn't be bothered to go and went into town for eggs & ham.